Those damn evolutionists are yapping again. The 47m-year-old primate, named Ida. Here is a story that has hit our media a few hours ago, and has got the evolutionists jumping up and down with excitement. Claims are being made that this new primate species is one of our ancestors, and as a result provides some insight into our ancestry. The media have even gone as far as to claim that this find is the “missing link” in human evolution, although, most evolutionists will tell you that there is enough evidence for evolution, and thus there is no missing link. My views on this are quite simple, it’s just another species of a primate, nothing more, nothing less. Originally discovered in 1983, Ida has been kept a secret for 20 years by the amateur fossil hunter until he decided to sell it through German fossil dealer, Thomas Perner. 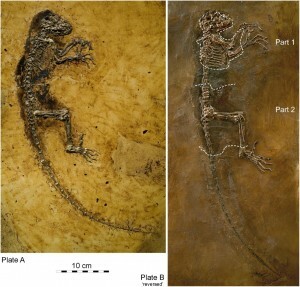 Perner approached Dr Jørn Hurum 2 years ago, a palaeontologist from Oslo Universitiy’s National History Museum, who subsequently became the buyer of the fossil, taking a risk in buying just from pictures provided by Perner. Hurum assembled the scientific team to begin analysis of the fossil. Hurum chose the name of the fossils as it was at the stage of development equivalent to that which his daughter named Ida currently is. Complete Primate Skeleton from the Middle Eocene of Messel in Germany: Morphology and Paleobiology (PDF). On to the actual title, evolutionists. This discovery, as mentioned earlier, has got the evolutionists around the world very excited. To be honest this discovery in no way adds to the validity of the theory of evolution. All these evolutionists have done is got various species of primates, placed their heads in order of size, and claimed this is an evolutionary process. Well, let’s argue science with science. Momentarily delving into physics, the second law of thermodynamics, a scientific fact, states that the universe is unavoidably proceeding towards increasing entropy. Entropy, in Lehman’s terms, is a measure of disorder. So, according to the law, the universe is heading towards a more disordered and disorganised state. In the theory of evolution, the proposed mechanism is understood as evolution to more complex, more ordered and organised structures, thus a more ordered universe. This theory therefore completely contradicts the second law of thermodynamics. Furthermore, a look at human evolution and fossil discovery and dating has led to the understanding that our so called evolutionary acenstors had at one point co-existed on earth. So, evolutionists, calm down and let us “creationists” as you call us continue to do what we believe in. This discover is in no way a challenge to my faith, and should be no challenge to the faith of others. Just another addition to the evolution propaganda. I hope you are happy accepting a theory that, quite clearly, is contradicted by the very thing you rely on, science.